It’s outdoor movie time again in New York City! The tradition of screening films in city parks at dusk has become more popular than ever. (Just check out this complete list of this year’s offerings.) As you prepare to spread your blanket on the lawn of Bryant Park to await a Hollywood classic, just realize that you are part of a grand tradition in the city that traces back almost one hundred years. Yes, there were outdoor (or open air) theaters showing films almost as soon as the medium became popular. This is not terribly surprising. 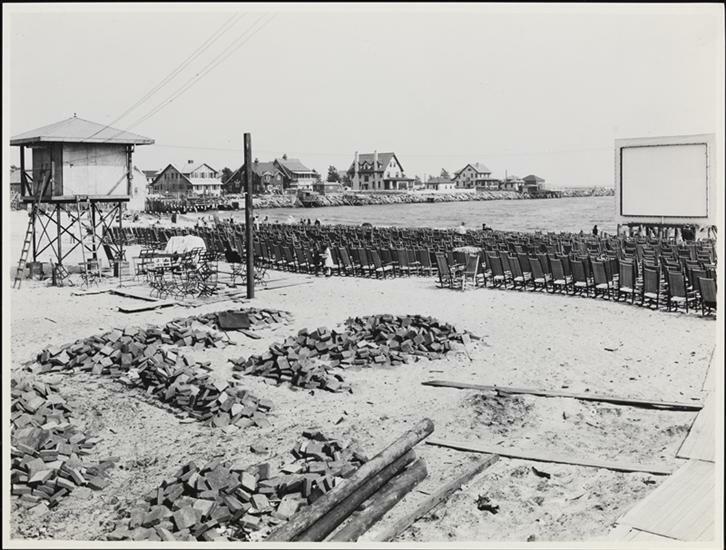 There were already outdoor playhouses for theater and vaudeville, and, in an era of over-crowded tenements and no air conditioning, any reason to sit outside on a nice summer’s night seemed practically luxurious. One drawback outdoor movie lovers deal with today is the loud city interfering with the sound of the movie. Not so then; the city might have been loud, but the movies had no sound. It was a purely visual sensation, a thrilling entertainment light show under the moonlight. 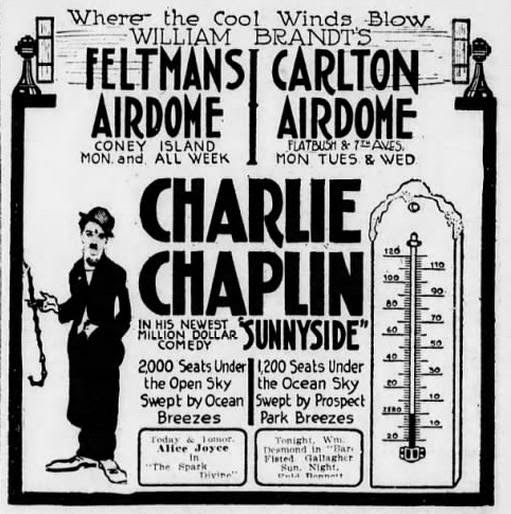 At right: An advertisement for a rare Midtown open-air theater. The lights of Broadway and street noise would have been a serious impediment. 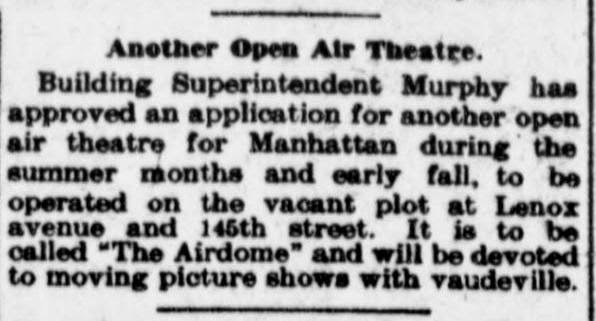 From surveying various newspapers from the 1910s, it appears most airdomes were located either in upper Manhattan and the Bronx (where there were more open lots) or in Coney Island (where the masses went for recreation). As with modern outdoor theaters, sometimes reality elbows its way into picture. 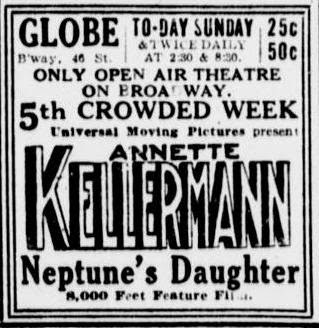 One of the Bronx’s most prominent open air moving picture theatres was the Nickelet (at Tremont and Prospect avenues), presumably named for the admission price. One evening in June 1913, audiences witnessed a terrifying sight — a woman burning to death in a building adjacent to the theater lot. Audience members scrambled to her rescue to no avail. The transient nature of the airdome — and the ability for anybody with a license to have one — did cause friction at times. During the spring of 1909, in the Long Island town of Freeport, a Brooklyn man enraged the town when he set up an airdome there even though he was not a town resident. The airdome never went away of course. But the experience paled in comparison to the grand delights of the movie palaces, especially when air conditioning technology came along. They eventually died out, along with the rooftop garden, in the 1920s, only to return later in the century when sound and projection technologies allowed for a more enjoyable evening at the movies.